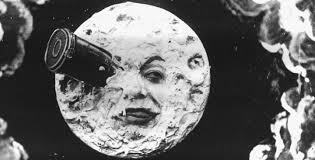 I thought I would kick off my 2014 journey toward the 101 goal by reviewing the first film listed in the 1001 Movies To See Before You Die book, A Trip to the Moon (1902), or Le Voyage Dans La Lune to use the original French title. This film is a true landmark of world cinema as it captures the time where the form was expanding out from the short, slice of life films that had been pioneered by the Lumiere Brothers in the late 19th Century. Georges Melies is one of the genuine fathers of film as we know it. He was also perhaps film’s first genius and that is well and truly on display in A Trip to the Moon. The story, based on a novel by Jules Verne, occupies the same space that so much of Verne’s work did – the intersection between the adventure story and more fantastical elements. The simple story of brave men who journey to the moon, find aliens there and beat them to death with Earth’s most awe-inspiring and powerful weapons (umbrellas of course) is proof positive that you don’t need dialogue or even intertitles to convey narrative. The film feels fantastical from the start and it also feels more ‘big budget’ than other films of the time. The cast is large, even if most of the bit parts are indeterminable from one another, and the costuming is opulent. Despite my love for classic film, I am not one of those, ‘movies were better back in the day’ kind of guys. 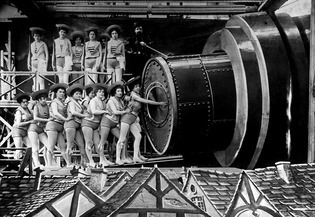 But there is no doubting that something totally lacking in film today compared to the silent era is the loving attention to detail that went into the construction of a movie. For an exceptional example, look no further than this film. The sets, props and design are all so lovingly detailed that practically any director working today could learn a whole lot from this film. In Melies day, technology bred creativity. Today, improved technology seems to only breed complacency and laziness when it comes to storytelling. Except in all too rare instances such as Alfonso Cuaron’s Gravity (2013). As well as the attention to detail, like so many other cinema innovators, Melies was on the cutting edge of improving the technical presentation of film stories. The editing in this film is pretty amazing, seeing the kind of fades that Melies was using over 110 years ago. A Voyage to the Moon, despite its age, takes you somewhere truly fantastical. No doubt if you are a fan of silent and classic cinema, you would have already caught this. If not though, no matter your cinema preferences, take the short time required to check it out. A Trip to the Moon is an open source film which means it is widely available in various forms. Here is a decent copy of the film that I watched on Youtube. Take a look and let me know what you think in the comments section below. Nice review man. It can be a little difficult to follow what’s going on at times but considering when it was made then this is unbelievable. Just imagine watching this when it was made, it’d have been amazing! Yeah that is true, is a little hard to follow exactly what is happening. But as it is so short, they move quickly through those parts into some more cool imagery or something like that. Good review. This is pretty awesome. I really need to see this, even the oldest still hold up. You certainly should. Take a look at the copy I embedded when you have a spare moment. Thanks for commenting man. That’s quite interesting. I;m sort of the opposite. Even if the music is not great, I still need it. I even found a slightly better quality version of this film on Youtube but passed it over cause it had no sound. I find that somehow the silence is more distracting. The moon from this movie scared the bajeezus out of me as a kid and still does. Well there you guy. A Trip to the Moon as a horror film. Nice review. An excellent movie and its visuals still look astounding today. Cheers for commenting man. Yep, the design in this film is really something to behold.